An animal's ears do more than help him hear -- they can help him beat the heat, too. Animals like African elephants and jackrabbits have notably large ears because they live in hot environments and need all the help they can get to stay cool. Large ears help cool an animal only if he needs it -- that is, if the animal lives in a warm environment. The size of the ears are an evolutionary adaptation. This is why certain animals that live in particularly hot environments have bigger ears than their counterparts in cooler environments. The perfect example is the elephant. 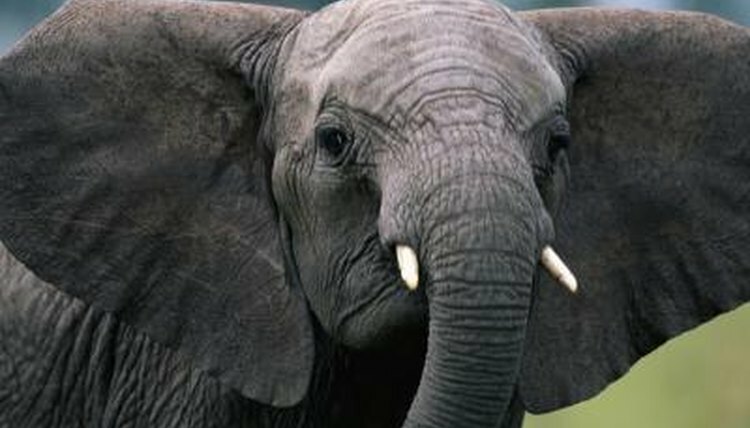 The African elephant has the largest ears of any species of elephant, because he lives in the hottest environment. The Asian elephant has smaller ears. The woolly mammoth -- a prehistoric ancestor who lived in the arctic -- had small ears, because he didn't need the help staying cool. Elephants have thick skin, up to 1 inch thick in places. The ears, however, are not thick. An elephant's ear skin can be as thin as 0.04 inch -- which places his blood vessels close to the surface. His massive ears are filled with blood vessels, and because they are so close to the skin, heat dissipates from them. As his blood circulates inside the ears, it cools before circulating back to the body. Because an animal doesn't necessarily need help cooling down all the time, his body knows how to make adjustments accordingly. The jackrabbit, for example, cools off with his large ears similarly to the way the elephant does. The desert gets cold at night, though, so the rabbit's body slows circulation to the ears to keep his body temperature from dropping too much. Large ears also help an animal cool off when he takes a dip. Water on your skin carries heat away from the body -- this is why we sweat and why you feel cooler after getting out of the swimming pool. The more water on your body the more heat is carried away. Animals like elephants cover their bodies in water, including their ears. They spray water on their backs and head and ears with their trunks. The large surface area of the ears promotes dissipation and accelerates the transfer of heat.